Featured project: Carbon steel, structural weldment — ABW Technologies, Inc. Create a 30,000 lb carbon steel, structural weldment, fabricated in accordance with AWS D1.1 and other customer-required specifications. We fabricated this weldment, for use in the defense sector, from a single-deck plate, approximately 48-feet long and 10-foot-4-inches wide, secured with over 250 fasteners. All welds associated with the beam-to-beam intersections were full penetration welds that required a magnetic particle NDE inspection, performed by our in-house experts. All material joins were fully welded. Due to the design of the structure, this created numerous areas where welders were welding without direct line of site—a challenging task, but one they have the training, skills and experience to execute to the highest possible standards. 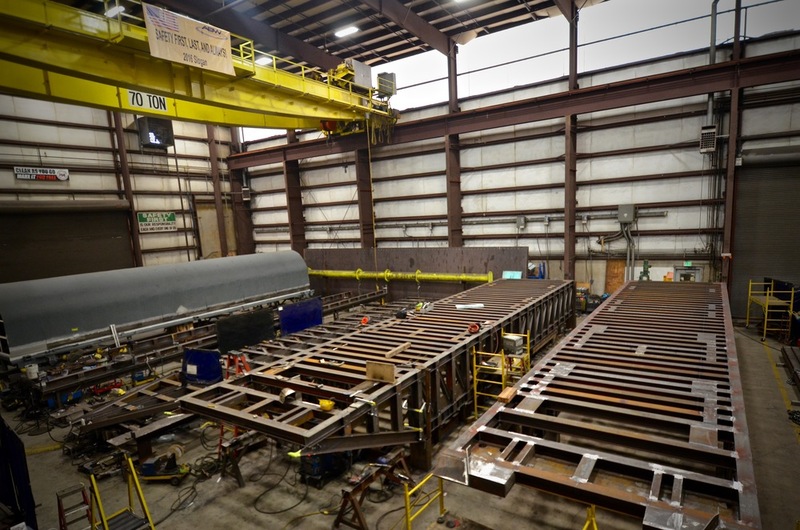 These large structures are fully fabricated, blasted, coated and assembled at our Arlington facility.